Used by: TPA Certified Prescription eye wear, topical pharmaceutical agents & oral medications. 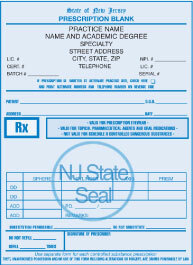 Standard New Jersey Tamper Resistant Prescription pad, black ink, numbered, 1-part, 100 per pad, Size: 4" x 5 1/2". Due to file size, the NJ pads are partially detailed. Includes all security features required by New Jersey for non-electronically transmitted prescriptions. PRICE IS PER PAD, MINIMUM ORDER IS 10 PADS. •Please type imprint information. Be sure to include; Physician name, Practice name, Specialty, DEA number, TPA Certification number, License number and address. License Verification Required. •For each doctor, please fax to Ancom a valid copy of the DEA certificate with the doctor's signature and the shipping address on it. 330-225-3434. NOTE: The actual "ship to" address on the order must match the address on the DEA certificate.